With a bright day in prospect and ‘erself off doing good deeds for the Greensand Trust, I thought I’d get some exercise in the all-too-infrequent clement weather by going for a walk. The difficulty, for me anyway, is to decide where to go. After some staring at a local OS map, I decided to take myself off to Woburn and wander the few public footpaths through the deer park. My decision to go to Woburn was “encouraged” by my wanting to see if any dragonfly activity remained at Upper Drakeloe Pond. I packed walking boots against any mud and trekking poles to help me up hills and set off. I did spot a dragonfly, a Common Darter (Sympetrum striolatum) as I walked past Drakeloe on the way in. Then I headed on towards the Woburn grounds proper and the deer park. 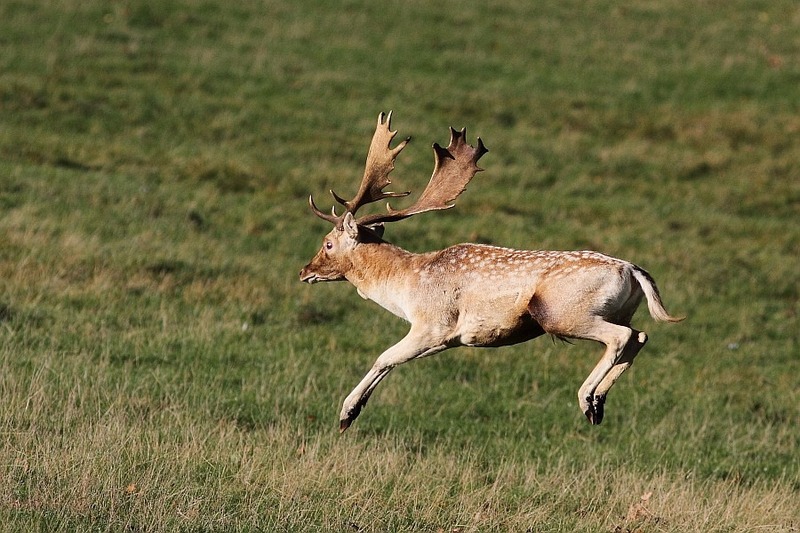 Woburn Abbey’s Deer Park boasts nine species of deer roaming about in 8000 acres of mixed grassland and woodland. It’s a very pleasant area through which run three public footpaths. The big problem, IMHO, is that word “through” – there is no circular walk that can be made within the grounds. Rather, the three paths fan out in different directions and never meet again. Two of the paths are joined by an access road for cars but curiously, pedestrians are not allowed along it. Walkers straying from the three paths tend to be descended upon by rangers in pick-up trucks. This is fair enough, it is private property after all, but a circuit would be good rather than three separate there-and-backs. Of course, it is possible to complete a circuit by stringing together a few footpaths and/or country lanes beyond the park’s boundary but even that isn’t particularly easy. My second brief diversion along this first track was collecting a pocketful of fallen sweet chestnuts. Not sure what I’ll do with them but I’ll think of something. As I headed into rather muddy woodland towards the limit of this path, I did an about turn and retraced my steps to where another of the footpaths went off. The second footpath took me to the opposite side of the deer park. As well as seeing another couple more fine Fallow Deer, I eventually spotted a small group of Red Deer (Cervus elaphus). They were at some distance from me on the far side of one of Woburn’s lakes. A stag was strutting around with a small harem of hinds. Of course, this is rutting season. I continued to the effective limit of this second track before doing another about turn and heading back. 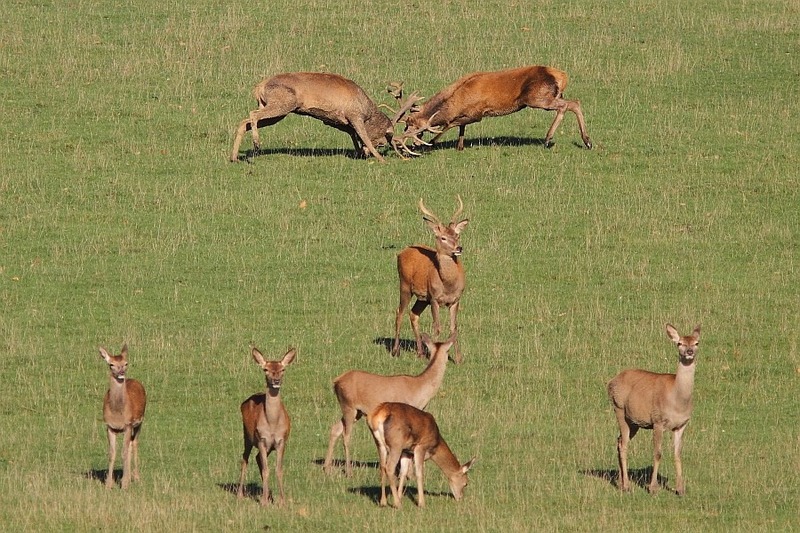 I was paying the Red Deer little attention until I heard a clash of antlers. 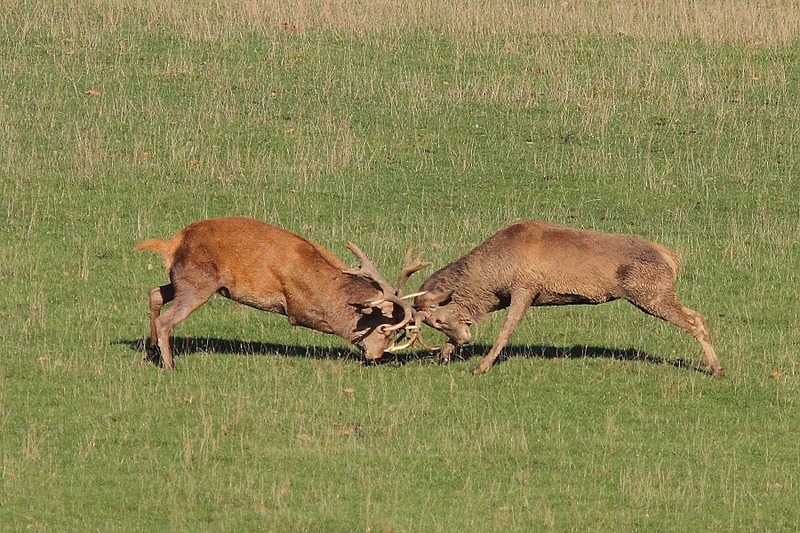 I was treated to a duel between two Red Deer stags, a sort of prize fight, while the prize in question, the hinds, simple stood around apparently unconcerned. I managed a rather distant shot but it’s quite an interesting composition, I think. There’s a somewhat closer crop of the action, too. A couple of years ago we made a slightly stressful journey to Richmond Park to see something of the Red Deer rut and here it is on our own doorstep. Richmond is still worth a visit, though, it’s a wonderful environment to experience.